China Flexible Hose Manufacturer yaang supplies SUS304 Flexible Braided Hose, 1 Inch, 1M. Helical hose is fabricated in a continuous spiral corrugation and has a unique property of self-draining. It can be designed with standard pitch, open pitch and super flex for different requirements of flexibility. 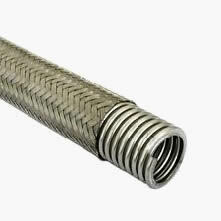 Corrugated hose and reinforcement are available in stainless steel 304, 321, 316L. 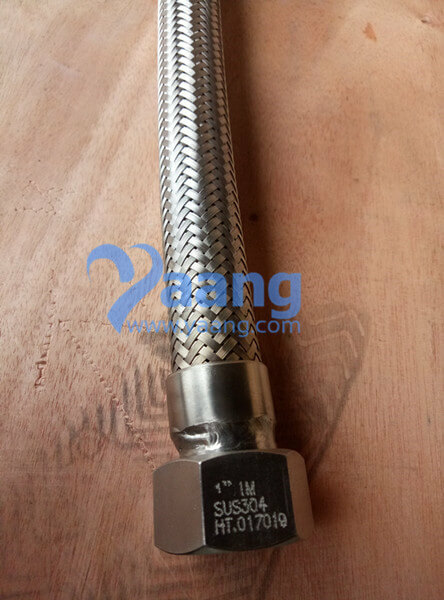 This flexible braided hose is adequate to sever hydraulic applications with its wide range of working temperatures from cryogenic to 662 °F (350 °C) and high working pressure up to 3625 psig (250 bar). 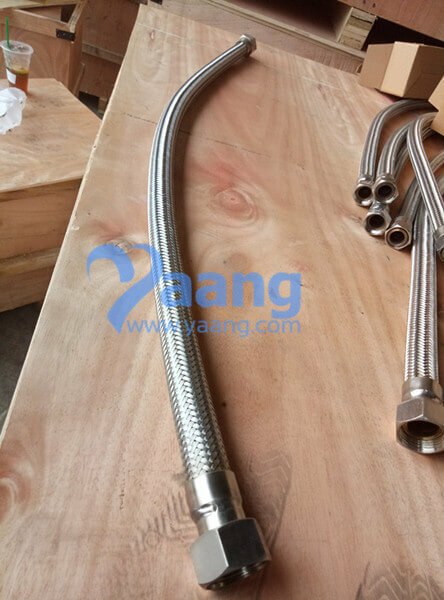 Flexible stainless helical hose provides three types - unbraided, single braided, and double braided. All the data in the table below are all tested at 70 °F. Please consult temperature correction table for practical applications. Flexible metal hose is a piping element used for conveying materials ranging from natural gas and oil to steam and engine exhaust. Its main advantages over solid tubing and piping are that it provides added protection against abrasion and pressure, and that it dampens vibration. In addition, flexible metal hose is far less susceptible to high temperatures and pressures than many other types of hoses. Flexible metal hose is fabricated from a variety of corrosion-resistant metals, including stainless steel, aluminum alloys, and corrugated bronze. In the case of bronze hoses, the bronze tube is typically encased in a braided metal shielding, which provides added resistance to wear and pressure. These hoses are used for extremely high-temperature and high-pressure applications. Among the flexible hose designs available are helical hoses, which feature a screw shaped wind; annular hoses, which have a round, accordion-like, or ribbed, wind; and braided hoses, which consist of a central bronze tube and a weave of fine metal strands. Flexible metal hoses can also include a corrosion resistant liner. Flexible metal hoses are integral components to a number of devices and applications. Perhaps the most visible uses are as refrigerant and natural gas lines, although flexible metal hose also finds use as piping for high-pressure water, and for various food-processing tasks. Many appliances, such as refrigerators, ovens and other heavy-duty devices, incorporate stainless steel (and other) hoses. Flexible metal hose is also useful for a variety of machines that run on, or utilize, compressed air. 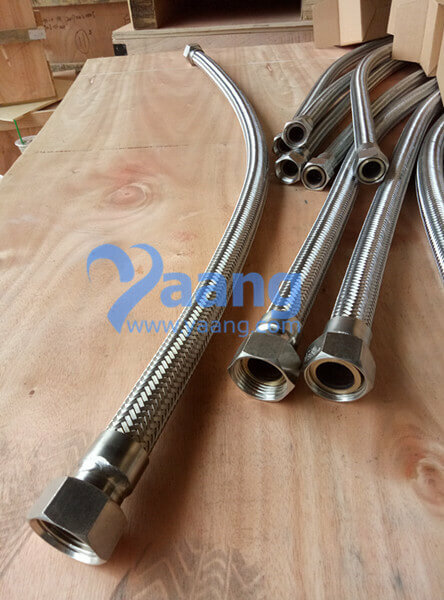 Measurements for flexible metal hose are designated by pipe size, referred to as NPT, which is not the actual size of the pipe. Each NPT listing corresponds to an outer diameter (male fittings) and inner diameter (female fittings) measurement, and purchasers should consult with suppliers/manufacturers to determine the proper hose needed. Length and pressure rating can also be addressed. 4) Possible lateral and angular expansion absorption by the additional bellows. 5) To provide a non-stressed area where the pressure is not too high such as pump and compressor applications.